Have You Ever Seen Somebody In A Wheelchair Get Up And Walk? Have you ever been out in town and seen somebody who looks perfectly healthy get out of a car they had just parked in the spot for disabled people or seen somebody on a mobility scooter park outside and walk into the shop? If you are anything like I was before I fell ill, you might think these people are faking and milking the system for benefits and attention, but you'd be wrong, just like I was! This week is Invisible Disabilities Week. An annual awareness campaign where patients and activists share their knowledge and experience of life with invisible illness and disability. In 2015 I became severely ill with an invisible chronic illness. Before that, I was very judgemental about others when it came to illness and disability. I believed that if people ate healthy, did exercise and avoided cigarettes, drugs and alcohol that they'd not get sick and that wheelchairs were for people who couldn't walk - the real issue was that I was simply ignorant of the realities of chronic illness and invisible disabilities. I just didn't know any better. Chronic illness has completely turned my life and the lives of my whole family upside down, restricting me to my house and often my bed for years, but if you ever saw me outside, you'd think I was still completely healthy because my condition doesn't cause any physical deformities and cannot be detected visually. I have an invisible disability. There are many conditions that are terribly debilitating and life destroying yet don't manifest any visual signs that others would identify as an illness or disability just by looking at you. They include autoimmune conditions (like lupus and hashimotos), mental health conditions (such as depression, OCD and Bipolar), chronic pain conditions (like migraines, arthritis, fibromyalgia, CRPS, etc), respiratory conditions (such as asthma, cystic fibrosis, etc) and heart conditions to name just a few. People who suffer from these illnesses, despite looking healthy on the outside most of the time, can be severely restricted and disabled by their symptoms. I now know that many conditions are fluctuating. This means that what somebody might be able to manage today, they might not manage tomorrow. So many symptoms are unpredictable and can vary considerably from day to day. Just because somebody made it to the supermarket, or maybe even to the cinema yesterday, does not mean that they will be able to go out today or even for the next week or more. This is because the effort it takes to go out and socialise costs them dearly in the form of elevated pain levels, increased weakness and exhaustion. I now know this from experience. The "payback" can make it very hard to get out of bed or even brush our teeth. This is the part that you won't ever see - the days and weeks and months spent indoors paying for the short outings and fun we enjoy endure on rare occasions just to experience a bit of life outside the four walls we are often confined to. Yes, many of us can still walk, but using a stick or a walker or a wheelchair or parking closer to the entrance of a shop can make a huge difference for us. For me, using a wheelchair outside of the house means that I spend just one month in bed after an outing instead of five. It could mean that I won't have to resort to medicating daily for pain until my body recovers from the exertion - instead the pain might still be bearable. Using a mobility aid when out would mean that I could continue to shower once a week instead of having to skip 2 weeks at a time until I've recovered from the effects of the outing. It could mean that I get to walk to the sofa a few times a week instead of being confined to my bed for months. So you see, there are many ways we pay for the small efforts we make at normalcy. Please do not judge disabled people who are trying to participate in normal daily life activities. Do not judge when somebody stands up from a wheelchair or parks in the disabled parking spot and then walks into the store... any steps we can save means more energy and strength to take part in other activities like driving safely back home or cooking dinner or reading a bed-time story to our children. In the same way that wearing glasses helps me to see better, so that I can read and write and enjoy the beauty of nature and art, so my wheelchair helps me to move and explore and interact with the world outside my house. If I remove my glasses, I can still see, just not as well as I could with them on and my ability to function is diminished, I might get a headache and burning eyes from straining to see and that could last for a few hours. In the same way, if I don't use a wheelchair, I can still walk, but only a short distance and I will pay so dearly for it that my ability to function is greatly diminished for weeks or even months. Many think that using an aid is a terrible thing, as if the aid is a life sentence, a burden we bear. "Poor girl, she's confined to a wheelchair" or "Poor child, he has to use that computer to speak for him". That is simply not the case. Imagine for a moment what our life might be like if we didn't have those aids. It is comparable to somebody with failing eyesight being denied glasses or expecting somebody who wears glasses to never take them off. That would be terrible! Our aids, whether it's a talking computer or a walking stick or noise cancelling headphones doesn't matter, they help us to be more independent and experience everyday life with fewer debilitating consequences. They liberate us. They empower us. They help us - just like your sunglasses and your car help you! Mobility aids are not just for the paralysed, they are there to help us make the most of our very low energy and strength - so that we can enjoy small windows of independence. Using a stick, walker or wheelchair is liberating for most people with invisible disabilities because these aids often are the very reason we are able to go out and enjoy a bit of life outside. They allow us to go places and interact with people in a way we wouldn't be able to without them. They allow us to spend more time out with our loved ones than we would be able to without the aids. 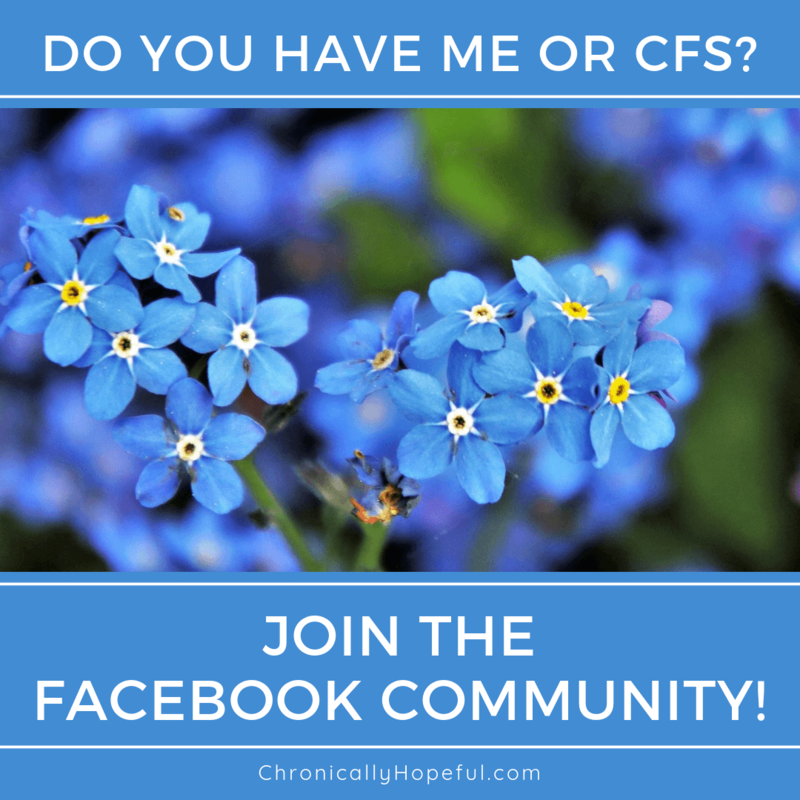 I have Severe ME (diagnosed as CFS in 2015). When I am in my house, I alternate between using a walker and walking unaided depending on how I am doing in the moment. Sometimes, when I stand up, I feel okay and stable enough to walk to the bathroom unaided, but most of the time this is not the case and I have to use the walker to steady myself. On the rare occasions I need to leave the house, I have to use a wheelchair. This is partly due to immediate need and partly due to the delayed post-exertion neuro-immune exhaustion (PENE) that will be so much worse if I don't use one. The severity of my symptoms is affected by emotions too, so the simple excitement of getting to go out, or the concern of a long car trip ahead or the stress of an assessment I have to go to can cause a severe decline in my ability and mobility. Even before I leave the house. Not to mention the exertion required to get dressed and ready to actually leave the house in the first place. There will also be movement, noises and lights to take into account. It all adds up. I might be able to stand up and walk a few steps while out, but without the wheelchair I'd be so weak, and in so much pain and shaking, that I would likely collapse and have to stay in bed, in the dark, not just for weeks afterwards, but months. I already pay for at least a month when I do use the wheelchair! Using the wheelchair, even though I can walk, means less pain, less breathlessness and fewer heart palpitations, which means more participation and stamina. It means less muscle fatigue and shaking, so more enjoyment of my rare outings. It even means less sensory overload and less cognitive dysfunction, so I have better focus and communication. It might be saving my legs from physical exertion on the day, but it's saving my entire body from a host of unpleasant symptoms for weeks to come! There seems to be a common belief among some healthy people that disabled people are somehow less than them, that we lack much or miss out on much of life and they pity us, some even look at us in disgust because they assume we have brought ill health upon ourselves by our own bad choices or that we are faking it. Leeching off the government and not contributing to society - this is just not true in the majority of cases. People don't realise that disability doesn't discriminate and illness doesn't actually care what diet you're on and how often you go to the gym. Accidents happen in an instant and we come into contact with a host of contagions and toxins daily - nobody is immune. So next time you see somebody get up off their wheelchair or mobility scooter, or walk from the disabled parking space, don't judge them. Don't call them out on it or leave a nasty note on their windshield. You might not see their invisible disability, but they're attempting a tiny semblance of normality and independence - and it will likely cost them dearly in terms of increased symptoms and missing out on things their loved ones do later. It does us such good emotionally and mentally to set goals for ourselves and accomplish them, even if it's only walking 10 steps or managing to sit through an entire film at the cinema. Unfortunately I was one of those judgemental people before I got sick. I never could have imagined the type of weakness, exhaustion and pain that can come from simply walking a few steps or being in a crowded shop with buzzing florescent lights. I would never have understood it if I wasn't experiencing it now, firsthand. This is why I keep sharing my experience. I hope more healthy people will realise that we might look healthy on the outside, but that doesn't mean we don't feel like death on the inside. Not all disabilities are visible. Isolation: where did all my friends go? Are You an Unchargeable or a Spoonie? Great post. None of us know what another is going through or what happens ‘behind the scenes’ we are too quick to judge. Thanks. So true! It amazes me how oblivious I was before falling ill myself. Shocking. Thank you. This article is great! It needs to be required reading for everyone!! Thank you for the lovely compliment, Emily. I am glad you liked the post. Feel free to share it if you think others will benefit from reading it. Happy New Year! wowowowow! this is so clearly and eloquently explained that i could have wept…( except that level of emotion would leave me ill for a week)! thankyou..I’m going to save and share the link when people need to understand! Please Note: All content is © Chronically Hopeful 2018. Duplication of entire articles from this site is strictly prohibited as websites with duplicate content are penalised by search engines. However, short excerpts may be used, provided that full and clear credit is given to ChronicallyHopeful.com with a link to the original content. Thank you for sharing.